From the moment ‘Stuff’ and ‘Nonsense’, our two human guides for the show, appear in the venue’s lobby, the fun and games begin. Since the Moomins were created by Finnish writer Tove Jansson in the 1940s, they have enjoyed various incarnations on page and screen and been popular across the globe. For this show, Mischief and Mystery in The Moomin Valley, the children take the floor in front of a deceptively simple-looking set. A giant pop-up book depicts the turning of the seasons, while the rest of the stage is strewn with battered suitcases which open to create a campsite, or a snowy hillside. What slight plot there is revolves around Moomintroll and his friendship with Snufkin - Stuff and Nonsense control the puppets to a prerecorded voice track. While these sections are enjoyable, and feature a couple of great songs, the two puppeteers frequently break the fourth wall to engage with and play games with their audience - playing imaginary snowball fights, telling improvised campfire stories and journeying under the sea. Judging by the response, these are the most popular parts. 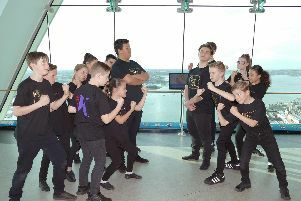 The blurb for the show says it is aimed at the four-to-seven age range, and while our boys are just on the younger end of that spectrum, they remained enthralled throughout. I’ll be honest, we went because mum and dad had fond memories of the Moomins from our own childhoods. While the hippo-like creations may lack the cultural cache among pre-schoolers of a Paw Patrol or a Bing, the characters are charming enough to draw in the youngsters at the first encounter. But with a major new animated version featuring some serious A-list muscle in the voice department (Taron Egerton, Kate Winslet, Jennifer Saunders, Matt Lucas, etc) coming in 2019, it seems that Moomin-mania could be heading our way again. The show is back in the area at Portsmouth Guildhall’s new studio stage on January 12 - catch the wave early.